This lithograph is taken from plate 7 of 'General Views of Lucknow' by Sir DS Dodgson. 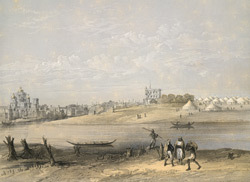 The tents seen in the sketch are those of the Rifle Brigade after the British recaptured the city of Lucknow in March 1858 from rebel Indian forces. The Residency is seen with its two towers just beyond the palaces. On the opposite bank of the river Gomti is the Dil Aram, behind which the rebels had a battery.